For the last decade, every article on the internet has advised us to market to Millennials. They may not have the funds to buy a house, but they sure like buying avocado toasts and other nice things, the slightly sarcastic adage goes. There was and is a lot of hubbub about where and how to reach the elusive Millennials, that target group smack in the middle of advertising’s formerly sacred 18–49 demographic. Granted, the internet is rife with jokes about Millennials, but that doesn’t mean they’re not a buying power and important to brands everywhere. But guess what? Millennials, or Gen Y, are actually on the way out and the next generation is busting in: Meet Gen Z. As Gen Z’ers are leaving college and starting their careers, they find themselves with disposable incomes and suddenly of great interest to marketers everywhere. Understandable, given that estimates suggest that Gen Z in the U.S. alone currently hold $44 billion in annual purchasing power. How does Gen Z tick? Do you have a multi-generational target audience? A social wall will help you increase engagement for your social media campaign. Collect content from over 15 social media channels and display it in an amazing live social feed. Gen Y, Millennials, Older Millennials, Younger Millennials, and now Gen Z? The terminology of generational research can get confusing, especially when the thresholds aren’t always clear-cut and the terminology tends to change at times. Depending on who you ask, Millennials were born between 1977 and 1995 (Source: Center for Generational Kinetics) or 1980 and 1996 (Source: Pew Research Center). After discovering a certain divide between older and younger Millennials, the term Xennials surfaced recently, applied to those born between ’77 and ’83. Xennials or Elder Millennials, born at the cusp of Gen X and Gen Y, share experiences with both of these generations and often claim that they feel like they belong to neither or both. They remember life without WiFi but were also the pioneers who first embraced digital life. In 2018, Millennials and Xennials are between 22 and 41 years old. Members of Gen Z were born in 1996 or later. In 2018, they are up to 22 years old. Older Gen Z’ers are just about to leave college. Their parents are predominantly from Gen X but occasionally also Millennials. They’re sometimes also called iGen, Centennials, Homeland Generation or Post-Millennials. Mobile phones attached to hands and fluent in all things social media, Millennials and Gen Z are often thrown into the same pot. But these generations differ more than you’d initially think. Two of the biggest defining impacts on Gen Y were 9/11 and the financial crisis in 2008. When the planes flew into the Twin Towers, Millennials were between 5 and 24 years old — a wide range of ages, but all at an age where they were in some way aware of what was happening. Ask any Millennials where they were on 9/11 and they can probably give you the exact details. Similarly, whether they were 31 years old and struggling to make ends meet or 12 years old and witnessing their parents struggle to make ends meet, Millennials consciously felt the effects of the recent Great Recession. Meanwhile, Gen Z grew up in a world that was already marked by 9/11 and by the financial crisis. Members of this generation likely have no first-hand memories of the terrorist attacks and grew up in a world where the U.S. was more or less always “at war with terrorism”. Every previous generation grew up still believing in the American Dream — work hard and you shall be rewarded. Millennials painfully felt the disappointment of finding out that this does not exactly hold true anymore. As the children of Gen X’ers and Millennials, though, Gen Z’ers never even lived under that illusion, which, ironically, has made it easier for them to navigate the vastly changed world we live in now. So how do they tick? They grew up during economic instability, so they’re mindful of what they spend money on. College tuition is higher than ever, so many Gen Z’ers focus less on higher education and become more entrepreneurial. Spend less, save more, is their principle. Only 26% of Gen Z say they trust elected officials — and that’s as more and more of these kids reach voting age. Nonetheless, they are political and genuinely want to change the world for the better, and they’re using social media to do it. What the Marjory Stoneman Douglas students have been doing since the Parkland school shooting is a perfect example of how Gen Z affects change. Gen Z is America’s most racially diverse generation and has a fluid approach to gender and sexuality. They’re also much less into drugs and alcohol than previous generations. Since they’re unlikely to believe in the “American Dream”, they are looking for authentic marketing instead of brands portraying some unrealistic perfect world. Growing up in a different way than Millennials has also influenced how they use social media. “They are the first to learn to navigate a tablet before they learned to talk, the first to conduct childhood friendships through portable devices, the first to have their births and baby photos and elementary school recitals shared on social media,” wrote Caitlin Gibson in the Washington Post in 2016. Gen Zers are the first true digital natives and as such, they have developed much better ways to cope with the information overload than generations before them, for whom the internet was still something they needed to consciously learn how to use at a certain age. Surprisingly for many marketers, this generation’s favourite network is YouTube. According to a 2017 study by globalwebindex, 84% cite YouTube as their top social media network, followed closely by Facebook, Instagram and WhatsApp. But with Gen Z it’s less about which channels they use and much more about how they use them and why. Gen Z kids value their privacy and prefer ephemeral content that doesn’t hang around for years online. They use Snapchat, where content exists for only a short time and away from parents’ and future jobs’ prying eyes, or Whisper, where they can express their opinions while staying anonymous. Meanwhile, Facebook is increasingly “for the olds”. 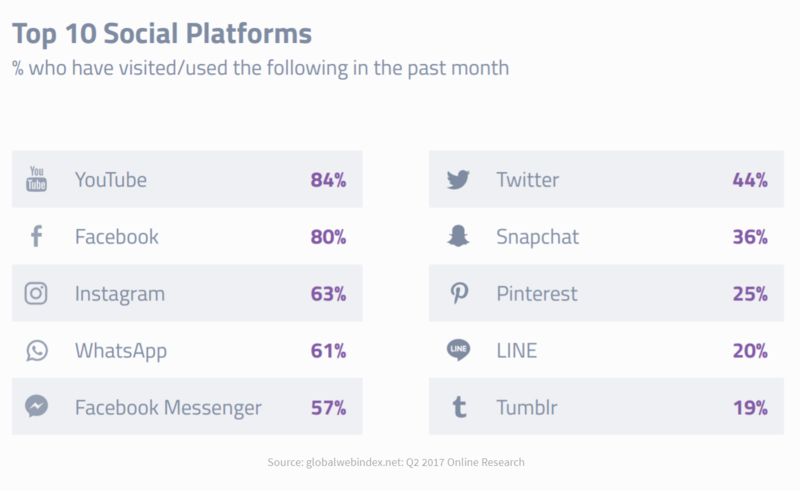 As the globalwebindex study shows, Gen Zers are using Facebook but they’re only on it to appease their parents or to coordinate group events. Some kids even keep separate secret private Instagram accounts, so-called “finstas”, in which they show a more honest, rawer version of themselves to only a small group of friends. And instead of tagging their friends openly on their “rinstas” (regular or real Instagram accounts), they keep their conversations safe in direct messages. For Gen Z, social media is moving away from curated feeds and towards quality time spent with people. They “live chill” or hang out online with their friends using apps like Houseparty, Airtime, etc. Live chill isn’t about presenting a curated image of one’s perfect life on Instagram, often a pressure-inducing and depressing thing for users, but it’s about creating a shared experience. There are no algorithms, no likes or hearts or emoji reacts, no filters or artifice of any sort. There’s just hanging out with other people they like wherever they are at that moment. Gen Z is notoriously hard to reach. A Nielsen Canada study of ad campaigns targeting Gen Z showed that 90% of impressions missed the target. Only one in 10 impressions was actually delivered to someone from the intended target group. One in ten! Partly, this is because Gen Z is extremely ad-averse. They skip or simply ignore ads unless an ad is really interesting to them. And with 8 seconds, they have even shorter attention spans than Millennials, so ads have to be convincing within a very short amount of time. Gen Z kids are also much pickier when it comes to whom they follow on social media. They’re less likely to interact with brands than Millennials and would rather follow actors than companies. This makes it harder for brands to reach this generation with direct brand-to-consumer interaction. Lots of the apps Gen Z use seem to be as fleeting as their content — they pop up and are suddenly shut down again —, making it much harder for older generations (and marketers) to keep up with what’s up. So to connect with Gen Z kids, brands have to increasingly figure out how they can be present on niche platforms and deliver interesting content that grabs attention quickly. But all is not lost for marketers. Here are some big trends for brands marketing to Gen Z in the near future. It’s all about good content and how it’s delivered. It’s time for brands to take personalisation a step further, past ads that are creepily following consumers around from one platform to the other. What Gen Z crave is 1-to-1 interaction with brands, from choosing a product to customer service. They want to be given a say, e.g. as a Twitter poll letting them vote for what product they would like to get a discount on or a poll letting them pick the next Ben & Jerry’s flavour. Furthermore, brands should foster peer-to-peer communication and let fans and followers connect with others who also like the brand. Gen Z has no patience for brands presenting a perfect world which they know is, ultimately, completely fake and unattainable. Brands have to be authentic and use real people to advertise. Think #AerieReal instead of Abercrombie & Fitch. There are many reasons for using influencers when trying to reach Gen Z. For one, this generation doesn’t trust marketing and advertising. And, as we’ve already established, it cherishes authenticity. So one of the biggest opportunities for brands looking to market to Gen Z lies in influencer marketing. Real people saying good things about real products holds sway over customers. Don’t think you need to hook the biggest celebrities for an Instagram post or YouTube video, though. Gen Z actually prefers internet stars or social influencers to mainstream celebrities. Remember that user-generated content also influences buying decisions. 40% of Gen Z say they’re happy to provide feedback. Leverage that user-generated content for your marketing and to convince more customers to buy your product. Gen Z turns to YouTube for entertainment and educational purposes as well as buying decisions. They even use YouTube the way older generations use Google, to research products by checking what influencers are saying about it. So brands are wise to embrace YouTube content as well. Make sure you have product videos online and arrange for reviews and how-to videos by influencers. And, importantly, optimise search for YouTube! One significant characteristic of Gen Z is that they tend to leave a social media network if they feel bad using it. Many say there’s too much negativity and that social media has previously hurt their self-esteem or made them feel insecure. So how do you market to a generation that is leaving social media because of negativity? You reach them with positive, affirming, inspiring content. More than ever it’s important for brands to not post harmful content and not engage in abusive language. Steer clear of racism, misogyny, homophobia, transphobia, ableism and the likes. Don’t body-shame or otherwise hurt users or Gen Z will be turned off. We’re just on the cusp of seeing Gen Z as a buying power and group to market to. Surely, many things will change over the coming years, as this generation grows and changes. 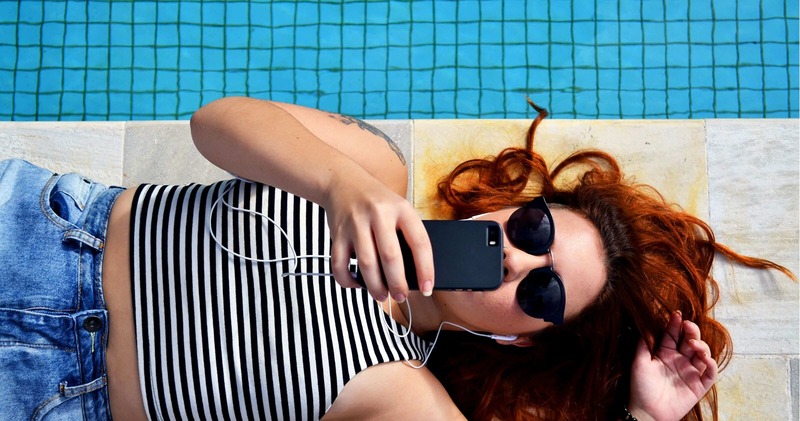 Considering how fast technology is moving and how fast Gen Z switches to new apps, marketers will have to keep their finger on the pulse of new platforms. Not everything will work for your brand, of course, but it’s always good to know where Gen Z are and how they interact with each other and with brands. By the way, we’re not saying you should stop marketing to Millennials. As we have learned, Gen Y and Gen Z aren’t totally different in the end. But it’s definitely time to shift focus and figure out how you can attract the next generation to ensure your brand keeps thriving in the years to come.